Let’s talk about your puppy! Early grooming is essential for any puppy, even if they’re a breed that requires less maintenance. Teaching your puppy the basics like handling and brushing is extremely important if you intend on bringing them in for grooming for years to come. 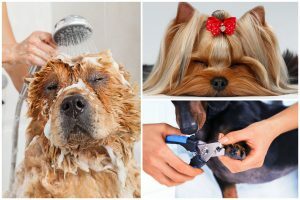 Grooming can be a stressful event for any puppy or a dog at any age, if they’re not accustomed to the grooming process. Puppies should be introduced to professional grooming when they’re about twelve weeks old. Your groomer may suggest that you bring your puppy in for a few short sessions, just to familiarize them with the sights and sounds of the grooming room. However, there is a lot you can do at home to ease them into the habit of grooming. Gently touch them all over every day, paying extra attention to their feet, the inside of their pads, under the eyes, and their ears. Once they’re comfortable with being handled, you’re ready to move onto brushing and combing. When brushing and combing your puppy, make sure to be gentle and give them as many breaks as they need. The key here is consistency! Every time you give up brushing when your puppy runs away, it lets them know they can get away with it. If your puppy is behaving well and accepting of brushing, reward them with plenty of treats and praise. Coming in frequently, whether for grooming or just to say hello can help them associate the salon with a positive experience. The main objective here is for your puppy to actually enjoy and look forward to grooming! Come in for a grooming assessment with one of our professional groomers! They can help you decide on a cut that will best suit you and your pup’s lifestyle.